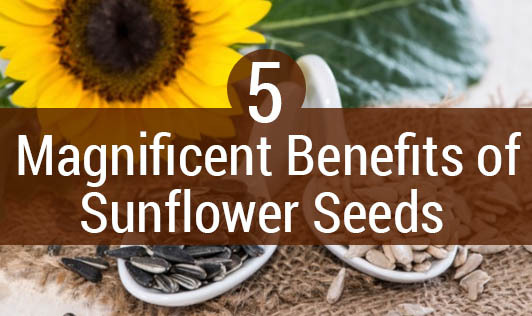 Sunflower seeds are filled with many health benefits that can be greatly helpful to you. These seeds are easily available all around the year, and just a small quantity of seeds can do wonders. Sunflower seeds control cell damage and thus play an important role in preventing cancer. This is because the seeds are rich in selenium, which is effective against cancer. Along with calcium, they also contain other bone-healthy minerals like magnesium and copper. It also contains lots of vitamin E, which helps to reduce arthritic pain. Sunflower seeds help you stay calm. They contain a lot of magnesium, which is known to soothe nerves, ease stress and migraines, and thus help you relax. They provide a healthy glow to the skin. The start nutrient here is vitamin E again. It combats the harmful UV rays and thus keeps your skin youthful and glowing. They help to alleviate all kinds of inflammatory conditions like joint pain, gastric ulcers, skin outbreaks, and asthma. This is because sunflower seeds are loaded with antioxidants. Just ¼ cup of the seeds a day is enough to gain all the health benefits. Sunflower seeds are also known to protect the heart. They contain healthy fat which is good for the heart. Sunflower seeds are really crunchy, have a delicious nutty taste, and therefore can be easily incorporated in the diet. All you need to do is sprinkle them on your salads, porridges, and stir-fries. You can also add them to your yogurt, pasta, and rice, or simply add them to your flour to make chapattis. The combinations are endless, just like its’ qualities.